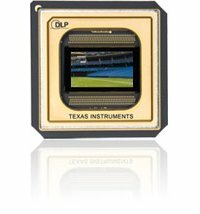 Texas Instruments demonstrated its latest DLP prototype that is way smaller than what you normally see on the market. This Pico projector is small enough to be placed on your finger tips with space to spare. The advent of such technology means future devices will be able to project its content without having to lug around a huge and heavy projector, expanding the horizons of cellphones, digital cameras, and portable media players by turning them into mobile cinemas. All you need is some popcorn and a fair amount of space on a preferably white wall and you’re good to go. Just make sure the surrounding environment is not too bright as one can presume such a projector won’t feature brightness levels that are up to par with today’s boardroom offerings. The DLP Pico proojector can be used as a standalone projector or integrated into a mobiled device, depending on your preference. This prototype is made possible thanks to the work done on DLP-based pocket projectors since last year. Some of the benefits of the DLP Pico projector include smoother images with no “Screen door” effect, crisp and clear presentation of fast motion video, beautiful colors generated by the BrilliantColor technology, and all round picture reliability over time since there is no fading, yellowing, or color decay over time as found in other display technologies. I can just imagine those corporate suits firing up their PowerPoint presentations on their smartphones using the DLP Pico projector, while college students will be able to organize impromptu movie sessions anytime, anywhere.